Named for the sweetgum tree (liquidambar styraciflua) a deciduous tree native to the southeastern United States, whose leaves turns spectacular shades of yellow, red, smoky purple, and brown in the fall. This bulked-up cowl is perfect for autumn, when you need a little bit of cozy, a little bit of warmth, and a whole lot of style. 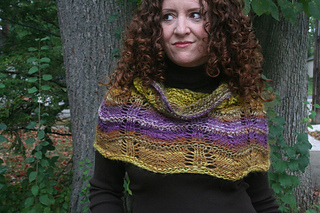 It’s bolder than a cardigan but easier to wear than a shawl. And it’s super-adjustable. Pull it down over your arms and shoulders, or pull it up over your head like a hood. This pattern was designed for the 4! Ounce! Challenge! 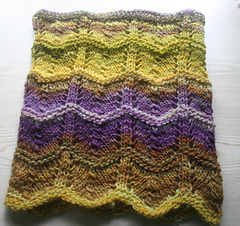 on Ravelry, a challenge to design patterns specifically for using 4 ounces or less of handspun yarn, but feel free to substitute any commercially available bulky and/or thick-and-thin yarn. Some have wondered how I got 320 yards of bulky yarn from just 4 ounces of fiber. 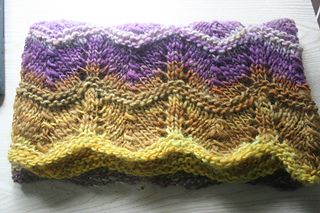 This yarn is a true thick-and-thin, so it isn’t remotely uniformly bulky (I would say it ranges from DK to bulky). I spun on the slowest whorl with a very low twist and ended up with a light and lofty yarn. When I spin singles this way, I generally get anywhere from 300 yards to 320 yards, depending on the fiber. 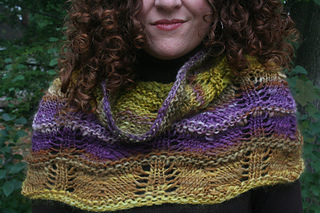 This yarn can knit up well on a range of needle sizes; I like it best on 10, 11, or 13. 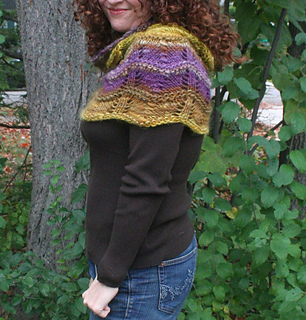 When I first published the pattern, I inadvertently uploaded a draft copy of the pdf. The draft was correct but included a chart that had letters instead of knitting symbols. I uploaded a second pdf within a couple of hours, but didn’t realize I hadn’t deleted the original pdf. Apologies to those of you who may have downloaded that pdf. I’ve deleted it and only the correct version is available now.